Sunday, November 19 is the 10th Anniversary of the Repose of His Eminence, Archbishop PETER (L’Huillier), who served as the Bishop of our Diocese for 26 years. Paul L’Huillier was born in Paris in 1926, and converted to Orthodoxy in 1945, while enrolled at St. Denys Institute. On August 30, 1954, he was tonsured as a monk and took the name of "Peter." On September 4 and 5, 1954, he was ordained hierodeacon and hieromonk by Archbishop Boris, Exarch of the Russian Patriarchate in Europe. Six years later, he was elevated to the rank of Archimandrite. On September 12, 1968, Archimandrite Peter was consecrated Bishop of Chersonese (Patriarchal Exarchate in Western Europe). In 1979 he was invited to serve in the Orthodox Church in America by Metropolitan Theodosius. He accepted and was installed as Bishop of Brooklyn that year. 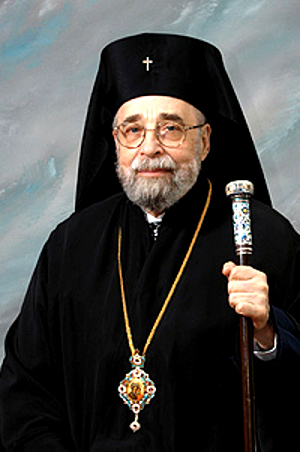 Two years later, he succeeded Metropolitan Theodosius as Bishop of New York and New Jersey, and in 1990 he was elevated to the rank of Archbishop. Especially in his younger and healthier years, His Eminence enjoyed administering the Diocese and visiting its many parishes, most especially the Cathedral of the Holy Virgin Protection in Manhattan. His greatest delight, however, was teaching. He travelled every week to St. Vladimir’s Seminary, where he taught canon law. When Archbishop Peter became too ill to travel, his students came to the diocesan chancery for instruction. Until the very end of his life, he was able to answer questions and quote canons off the top of his head in French or Russian or Greek or English. His Eminence was the consummate scholar, the author of a number of books and countless articles on Orthodox Church life. His specialty was the Ecumenical Councils and their pronouncements. His expertise, wise counsel and sage advice were often solicited by hierarchs not only in the OCA but from all the Orthodox Churches. His academic brilliance was respected not only in the Pan-Orthodox world but also in ecumenical circles. Archbishop Peter always stressed the pastoral dimension of Orthodox canon law – knowing the canons’ rank in importance, their historical significance, and their application in Church life: when strict adherence is absolutely necessary, and when economy may be extended. This, His Eminence contended, cannot be learned from a book but must be acquired through a passed down, experiential life in the Church. His Eminence retired from active episcopal ministry in 2005 and fell asleep in the Lord on November 19, 2007. He is buried in the mausoleum on the grounds of St. Tikhon's Monastery cemetery. I am honored to merely follow in the footsteps of a hierarch of such stature, a giant in Orthodox theology in our land. With this in mind, I am asking that every parish in our Diocese schedule a memorial service for His Eminence either this weekend or next.